A new technology called “augmented reality telementoring” is being developed to support battlefield surgeons with top specialists located thousands of miles away. Current telementoring processes divert the surgeon’s attention from the operation. Telementoring is widely used but still primitive that it has not kept pace with advances in information technology and computer graphics. Usually, it’s done with a telestrator displaying a video of the surgery overlaid with the graphical annotations. 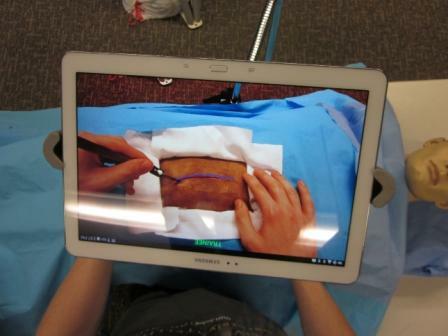 The new system for Telementoring with Augmented Reality (STAR) harnesses various technologies, such as transparent display, displays and sensors, to improve communication between mentor and surgeon. The system integrates the mentor annotations and illustrations directly onto a transparent display placed between the surgeon and the operating field, eliminating the surgeon’s need to shift focus and look at a telestrator. Telementoring is especially useful in rural and field hospitals, where certain surgical skills are in short supply.